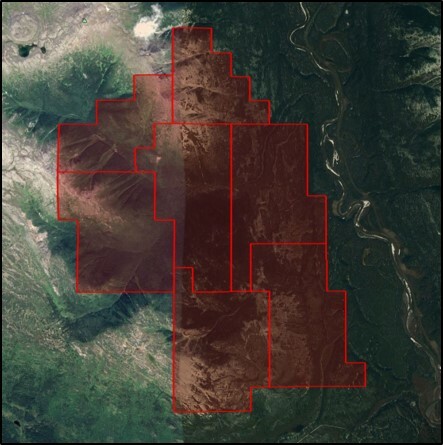 HAWKEYE owns a 100% interest in the 2,635-hectare McBride Project (the “Property) situated approximately 12 kilometres east-northeast of the Village of Iskut, BC, Canada. The Property is located west of the Klappan River surrounding Thatue Mountain, and contiguous to the northern boundary of the Red Chris Mine, and within 2 kilometres of properties held by GT Gold. The Property occurs within the Stikinia Terrane, primarily lies within the Jurassic-age Hazelton Group calc-alkaline volcanics and is located only 18 kilometres east of the recent GT Gold “Saddle” discovery where significant values were reported in soil sampling programs and their 2017 drilling campaign. Mr. Greg Neeld, President & CEO states, “HAWKEYE is excited to be involved in the Golden Triangle of northwestern British Columbia. It provides HAWKEYE with an initial footprint in a significant mining district known for many producing mines (Red Chris, Snip, Johnny Mountain, Eskay Creek, Valley of the Kings), large advanced projects (GJ, Schaft Creek, Galore Creek, KSM) and recently several exciting projects highlighted by GT Gold’s 2017 discoveries. 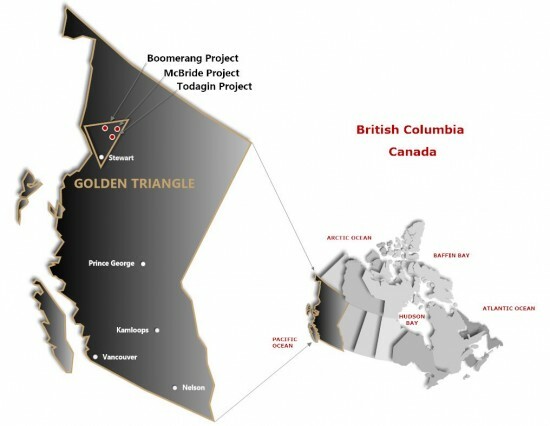 The continuing success of many projects and regional infrastructure development by Federal and British Columbia governments, combined with the increased gold prices will focus renewed exploration activity and the global investment community on mining growth opportunities within the Golden Triangle. HAWKEYE’s McBride Project is situated in the northeastern corner of the Golden Triangle and situated approximately 12 kilometres north of the Red Chris Cu-Au mine, 10 kilometres east and northeast of the North Rok and Rok occurrences, and 18 kilometres east of the Saddle discovery of GT Gold. 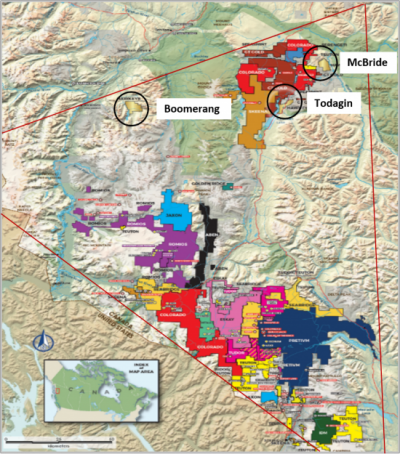 The McBride claims are also located contiguous with and proximal to large exploration properties held by other companies, and 30-40 kilometres northeast of the Skeena Resources’ GJ and Spectrum project. The principal occurrences in the region are hosted within the Hazelton Group and underlying Stuhini Group commonly associated with structural controls and intrusions. The Jurassic-age Hazelton basalt, andesite dacite and rhyolite flows and pyroclastics unconformably overlie either Triassic Stuhini marine sediments and volcanics, or older Paleozoic Devonian to Permian sandstone, siltstone, conglomerate, limestone and marble. Hazelton lithologies are overlain on Thatue Mountain by Upper Jurassic Bowser subaerial to deep marine sediments. Monzonite, diorite to gabbro intrusions of Triassic to Late Jurassic age, and Tertiary volcanics intrude the above packages. Numerous structural breaks with carbonate and silica alteration transect the Hazelton volcanics. Previous fieldwork in the area included regional mapping by government, and limited traverses during grassroots soil, stream silt and rock sampling programs by exploration companies tied to area plays associated with the nearby Red Chris Cu-Au porphyry project. Copper and gold values typical to porphyry targets were identified and abundant copper staining by malachite was observed in outcrop. Historical reports on Thatue Mountain reported quartz-carbonate pyrite-chalcopyrite veins with up to 2.78% Cu whereas other areas of the Property exhibited showings with quartz-carbonate stockworks with galena, sphalerite, chalcopyrite and pyrite.